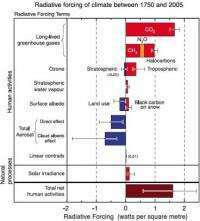 When people talk about global warming or the greenhouse effect, the main underlying scientific concept that describes the process is radiative forcing. And despite all the recent controversy over leaked emails and charges of poorly sourced references in the last Intergovernmental Panel on Climate Change report, the basic concept of radiative forcing is one on which scientists -- whatever their views on global warming or the IPCC -- all seem to agree. Disagreements come into play in determining the actual value of that number. The concept of radiative forcing is fairly straightforward. 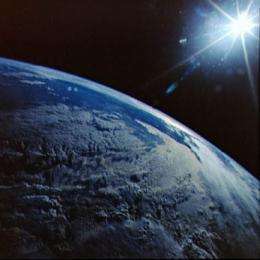 Energy is constantly flowing into the atmosphere in the form of sunlight that always shines on half of the Earth’s surface. Some of this sunlight (about 30 percent) is reflected back to space and the rest is absorbed by the planet. And like any warm object sitting in cold surroundings -- and space is a very cold place -- some energy is always radiating back out into space as invisible infrared light. Subtract the energy flowing out from the energy flowing in, and if the number is anything other than zero, there has to be some warming (or cooling, if the number is negative) going on. This is the first of a two-part “Explained” on the scientific concepts underlying the concept of the greenhouse effect and global climate change. Part 2. @marjoke: Please read the article before you comment to avoid making your normal foolish self apparent. For convenience, most researchers choose a “baseline” year before the beginning of world industrialization — usually either 1750 or 1850 — as the zero point, and compute radiative forcing in relation to that base. The IPCC uses 1750 as its base year and it is the changes in the various radiative forcing agents since then that are counted. Does that not make sense to you? I didn't think it was all that difficult. Where did the data come from? Is it freely and openly available? The solar constant sic has been measured to vary as much the combined effect of the so called greenhouse gasses- and that's only over the past ca. 40 yrs. "Radiative forcing “was very small in the past, when global average temperatures were not rising or falling substantially,” he explains." With this statement Prinn must still be using Mann et al discredited hockey stick graph (invalidated statistical methods on top of cherry picked tree ring data from a small area of Russia). The "consensus" is that the earth was warmer 800 - 1400 AD and much cooler from ca. 1600 to 1850 AD. When you catch a person lying to you one time, do you readily believe him the next time he tells you something? If you catch that same person blatantly lying to you many times do you believe him about anything? IMHO - Only if you are a fool or self-delusional. How is IPCC4 any different? You actually seem to think that redefining a term used in an article and within climate science somehow makes your comment more valid, even though it was pointed out to you that it was nonsense? When someone comes up to you and tells you that you're comparing apples to oranges, do you then redefine oranges in order for them to be the same thing as apples and make your argument valid? Once again you've proven that you have no idea what you're talking about and that you're just another turtle on a post. Note: MBH (Mann, Bradley, Hughes) has never been discredited. The above poster is a troll to ACC/AGW threads and reposts the same claims on a continuous basis without ever citing their sources, or at least a credible source. In response to challenges like that, however, the MBH hockey-stick research was redone with a new series of proxies in 2008 and came to the same conclusion. The solar constant has been measured to vary as much the combined effect of the so called greenhouse gases - and that's only over the past ca. 40 yrs. In theory, greenhouse gases are supposed to warm the atmosphere by absorbing reflected long wave IR passing through, but over 30 yrs of satellite data shows zero warming. With this statement Prinn must still be using Mann et al discredited hockey stick graph (invalidated statistical methods on top of cherry picked tree ring data from a small area of Russia). The "consensus", and evidence too, is that the earth was warmer 800 - 1400 AD and much cooler from ca. 1600 to 1850 AD. IPCC4 is a replete with politically based lies. It's not believable and either is Prinn et al, MIT or not. Is it really too much to ask for a creditable citation? The statistical methods were not invalid, they just weren't optimum for the analysis done, but using a different analytical method didn't change the results significantly. Your stupidity knows no bound. What is meant by out of balance is a delta. Still too difficult for you to understand? as you put it Energy in = energy out + energy stored. THUS a change (or delta) in energy stored. P.S: != means not equal in our crazy elitist mathematical coding languages. Part 2 to follow, hold your horses until then, sit back, and watch the Main Feature. MIT is the home of Prof Linzen, maybe Part 2 will be a the surprise? I think physorg posted this article just to get us away from the other articles. I refuse to debate this article based on the fact that everyone knows radiative forcing is a real element. (If you don't, you certainly shouldn't be speaking about climate in any manner, regardless of your stance). The contention is in the numbers quantifying said figure, as the article stated, and there isn't a person here who can speak to it with authority, myself included. @JayK THe hockey stick curve is based on a faulty statistical method. Using Monte Carlo number generation, and plugging those into Mann et al's statistical method one gets a hockey stick 9 times out of 10. The hockey stick is dead - a great example of garbage in/garbage out. You can believe what you want but facts are facts (they're not beliefs). @deatopmq: And you're still wrong. The hockey stick from MBH98 has been verified over multiple proxies and statistical methods. All you're doing is making a statement with nothing to back it up. If you have something, post the citation, otherwise you're just making noise with nothing but your own flute. I'd at least expect you to mention McIntyre and McKitrick or even Soon and Baliunas as backup to your assertions. Maybe you could even mention the scientific genius of Inhofe. But as I've stated in many threads, you actually have no proof of your complaint, you just keep repeating it, hoping that people will quit telling you that you're nothing more than a common liar. There are some things that every single scientist agree on, those that suspect AGW is unproven, and those that believe that AGW is real and dangerous. It has nothing to do with belief, it has to do with definitions of terms. Radiative forcing is a defined term. This article was very straightforward in describing the uncertainties involved in the calculation of the current level of radiation forcing. Scientists all around the globe are trying to get a better handle on measuring aerosol concentrations, types and distributions. As time goes on the numbers will be better defined. Show me all of the data, with error margins, for 1750. The only problem will be that the error margin will be far greater than the "radiative forcing". By the way, what kind of term is that (ie. forcing)?! @joefarah: That may have been one of the more useful questions you've ever asked. Of course, it is a leading question, but at least some can learn from it. Now I'll let the reader follow all the links and such, but the general gist of it is that the RF for 1750 vs. 1996 are based on solar minimals and give a high confidence factor. Well done, the only piece you're omitting, (probably accidentally) is that it gives a high degree of confidence for particular solar phase states. Now that we know how variable the sun is, the calulations get far more complex. Before any AGW opponents misread and jump on my commentary, recognize that although the computations are more complex, the only change you'll see is in a matter of minor degree and variance as opposed to flat out full spectrum changes. Yeah, I tried to find that article, Skeptic, but it didn't jump out at me. I'm betting that it is in the citations for one or more of the pieces I posted, and the confidence levels are discussed in the IPCC 2001 WG1 piece, and how the year 1750 is used for the greatest confidence level. That's not really that much energy seeing as you're talking about the whole globe. I think you're underestimating. That's less than 0.2 W/M^2, substantially less than the variation in the total solar energy received by Earth from day to day. So you think the energy released by 700,000 Little Boys....EVERY DAY is not much..hmm So the equivalent energy from over a quarter of a trillion of these bombs every year is not much over the last 50 years. Sure seems to me that will melt a hell of a lot of ice! So you think the energy released by 700,000 Little Boys....EVERY DAY is not much..hmm So the equivalent energy from over a quarter of a trillion of these bombs every year is not much over the last 50 years. Mary, you show your ignorance in the subject when you make alarmist claims as the above. How large do you think the surface area of the atmosphere is? Energy released by a single "little boy": 60 TJ or 60,000,000,000,000 joules. 60Tj x 700,000 = 42000000 TJ of energy. 1J= the amount of heat a person emits every 0.01 seconds. So to make this relevant to you. The amount of energy you're alerting us to on a daily basis is equal to the amount of heat energy that a family of 5 would naturally give off over the course of 63 years. You say I show 'ignorance'....how? What I used was a way to show the amount of energy required to heat the Earth )0.5C since 1960 ( a conservative estimate). Now tell me how many Olympic size swimming pools would be evaporated in one day by 700,000 Little Boy nuclear devices? Even at that, equal to one half of a percent of total irradiant power per day, multiplied by 365 days equals nearly 2 more days worth of additional heating per year. Can't exactly call that negligible, and you can't attribute it to any other cause than human activity.